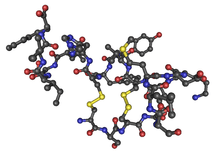 Endothelins are peptides that constrict blood vessels and raise blood pressure. They are normally kept in balance by other mechanisms, but when they are over-expressed, they contribute to high blood pressure (hypertension) and heart disease. There are three isoforms (identified as ET-1, -2, -3) with varying regions of expression and binding to at least four known endothelin receptors, ETA, ETB1, ETB2 and ETC. Earliest antagonists discovered for ETA is BQ123, and that for ETB is BQ788. Endothelins are the most potent vasoconstrictors known. In a healthy individual, a delicate balance between vasoconstriction and vasodilation is maintained by endothelin and other vasoconstrictors on the one hand and nitric oxide, prostacyclin and other vasodilators on the other. Overproduction of endothelin in the lungs may cause pulmonary hypertension, which can sometimes be treated by the use of an endothelin receptor antagonist, such as bosentan, sitaxentan or ambrisentan. The latter drug selectively blocks endothelin A receptors, decreasing the vasoconstrictive actions and allowing for increased beneficial effects of endothelin B stimulation, such as nitric oxide production. The precise effects of endothelin B receptor activation depends on the type of cells involved. The endothelium regulates local vascular tone and integrity through the coordinated release of vasoactive molecules. Secretion of endothelin-1 (ET-1)1 from the endothelium signals vasoconstriction and influences local cellular growth and survival. ET-1 has been implicated in the development and progression of vascular disorders such as atherosclerosis and hypertension. Endothelial cells upregulate ET-1 in response to hypoxia, oxidized LDL, pro-inflammatory cytokines, and bacterial toxins. Initial studies on the ET-1 promoter provided some of the earliest mechanistic insight into endothelial-specific gene regulation. Numerous studies have since provided valuable insight into ET-1 promoter regulation under basal and activated cellular states. The ET-1 mRNA is labile with a half-life of less than an hour. Together, the combined actions of ET-1 transcription and rapid mRNA turnover allow for stringent control over its expression. It has previously been shown that ET-1 mRNA is selectively stabilized in response to cellular activation by Escherichia coli O157:H7-derived verotoxins, suggesting ET-1 is regulated by post-transcriptional mechanisms. Regulatory elements modulating mRNA half-life are often found within 3'-untranslated regions (3'-UTR). The 1.1-kb 3'-UTR of human ET-1 accounts for over 50% of the transcript length and features long tracts of highly conserved sequences including an AU-rich region. Some 3'-UTR AU-rich elements (AREs) play important regulatory roles in cytokine and proto-oncogene expression by influencing half-life under basal conditions and in response to cellular activation. Several RNA-binding proteins with affinities for AREs have been characterized including AUF1 (hnRNPD), the ELAV family (HuR, HuB, HuC, HuD), tristetraprolin, TIA/TIAR, HSP70, and others. Although specific mechanisms directing ARE activity have not been fully elucidated, current models suggest ARE-binding proteins target specific mRNAs to cellular pathways that influence 3'-polyadenylate tail and 5'-cap metabolism. Recent studies have revealed a functional link between AUF1, heat shock proteins and the ubiquitin-proteasome network. Proteasome inhibition by chemical inhibition or heat shock was shown to stabilize a model ARE-containing mRNA whereas promotion of cellular ubiquitination pathways was shown to accelerate ARE mRNA turnover. Studies with in vitro proteasome preparations suggest that the proteasome itself may possess ARE-specific RNA destabilizing activity. The ARE-binding protein AUF1 has been linked to the ubiquitin-proteasome pathway. AUF1 mRNA destabilizing activity has been positively correlated with its level of polyubiquitination and has been shown to interact with a member of the E2 ubiquitin-conjugating protein family. Furthermore, under conditions of cellular heat shock AUF1 associates with heat shock protein 70 (HSP70), which itself possesses ARE binding activity. The ET-1 transcript is constitutively destabilized by its 3'-UTR through two destabilizing elements, DE1 and DE2. DE1 functions through a conserved ARE by the AUF1-proteasome pathway and is regulated by the heat shock pathway. ↑ Agapitov AV, Haynes WG; Haynes (March 2002). "Role of endothelin in cardiovascular disease". J Renin Angiotensin Aldosterone Syst. 3 (1): 1–15. doi:10.3317/jraas.2002.001. PMID 11984741. ↑ Schinelli S (2006). "Pharmacology and physiopathology of the brain endothelin system: an overview". Curr. Med. Chem. 13 (6): 627–38. doi:10.2174/092986706776055652. PMID 16529555. ↑ Bagnato A, Rosanò L; Rosanò (2008). "The endothelin axis in cancer". Int. J. Biochem. Cell Biol. 40 (8): 1443–51. doi:10.1016/j.biocel.2008.01.022. PMID 18325824. Kedzierski RM, Yanagisawa M; Yanagisawa (2001). "Endothelin system: the double-edged sword in health and disease". Annu. Rev. Pharmacol. Toxicol. 41: 851–76. doi:10.1146/annurev.pharmtox.41.1.851. PMID 11264479. Barton M, Yanagisawa M; Yanagisawa (2008). "Endothelin: 20 years from discovery to therapy". Can. J. Physiol. Pharmacol. 86 (8): 485–98. doi:10.1139/y08-059. PMID 18758495.